We’d love your help. Let us know what’s wrong with this preview of A Celtic Witch by Debora Geary. Cassidy Farrell is a world-class Celtic fiddler. And if she has her way, that's exactly who she'll stay. Except that's not what the rocks have in mind. Or a certain fetching spell. Or the truth working its way free in her own heart. Can the music, and perhaps a certain grumpy curmudgeon and his baby girl, help Cass find her life's new song? 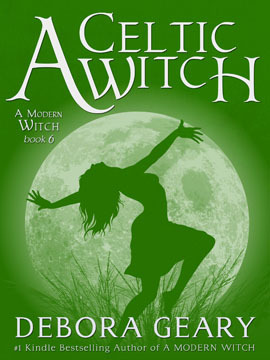 A Celtic Witch is book six of the t Cassidy Farrell is a world-class Celtic fiddler. And if she has her way, that's exactly who she'll stay. To ask other readers questions about A Celtic Witch, please sign up. Are these books for adults? YA? The series looks great and I am really interested in reading it. What a lovely lovely book! One of my favorite characters in the previous books is Marcus and I am oh so glad that he got his turn to grab on and pursuit happiness. Also having both the main romantic characters be established adults (over forty) almost set in bachelor ways were very nice, too. Even though each story has its own end, the series is best when read in sequence! So if you haven't read them yet, please do. It will put a smile on your face for sure! In order t What a lovely lovely book! One of my favorite characters in the previous books is Marcus and I am oh so glad that he got his turn to grab on and pursuit happiness. Also having both the main romantic characters be established adults (over forty) almost set in bachelor ways were very nice, too. In order to follow where their hearts lead, Cass and Marcus not only have to adjust their perception on life as is but also take a step into a new and unexpected future. After 45 that is kind of scary and takes a lot of courage. Geary sensei, IMHO takes that subject very well and presents it to us perfectly, not with melodrama but with honesty. The surrounding characters, especially children are just adorable, too. We see a lot of growing up done by the kids in the cove. I can just imagine Morgan with Marcus's scowl demanding her "fowers! " I wouldn't be able to resist that. Who could? What I love most about this series is that although magic is very important and plays a big part, it is not the most important thing. It is the love and affection the characters hold to everything that surrounds them. The love for the land, sea, community, their family and strangers. And when you read the books you feel as if you can be a little part of that world. Well at least it gives me a warm fuzzy feeling! If I were to complain, hmmm, it's too short!! I would have loved to read a more about the dual between Marcus/Ginia vs. Nell/Kevin team as well as verses Hacker! Or how Marcus got over his embarrassment after kissing Cass in front of sooo many people. I know the wedding story is coming soon and I cannot wait to read it. Nineteen year-old Cassidy Farrell's grandmother gave her wings when she told her, "Go, child. Fly. And when you're done and ready to come home, you'll know." Fleeing the rigid boundaries of a country that didn't understand or accept the magic of her music, Cassidy did, following the call of the rocks to a distant shore where fame and glory awaited. For twenty-six years, Cass has followed her heart and the open road, living for the music and the rocks that echo its magic. Though she finds solace Nineteen year-old Cassidy Farrell's grandmother gave her wings when she told her, "Go, child. Fly. And when you're done and ready to come home, you'll know." Fleeing the rigid boundaries of a country that didn't understand or accept the magic of her music, Cassidy did, following the call of the rocks to a distant shore where fame and glory awaited. For twenty-six years, Cass has followed her heart and the open road, living for the music and the rocks that echo its magic. Though she finds solace in little places like Margaree, Nova Scotia and retreats to them yearly for rest, she lives her life in the spotlight, playing for crowds of thousands and refusing to settle anywhere. But when she finds a warm welcome and a nearly irresistible pull on an unplanned jaunt to a remote village , will Cassidy finally be able to settle down and find the roots and home she's forfeited for so long? If a tiny girl with purple eyes and a village full of people who understand the meanings of family and magic and home have anything to say about it, she will. After losing his twin brother at age five, Marcus Buchanan walled off his heart and soul against the possibility of love and companionship, becoming a staid and cranky man who pushed away every attempt to heal his heart. Though his barriers were finally shattered by an amazing reunion and the gift of a little traveler, he still has a long road to travel on the road to recovery. Firm in his roots and settled in his ways, Marcus isn't one for flight or freedom. But what happens when a soaring Celtic woman with eyes of green shatters his calm and has him yearning for the life of freedom her music describes to him? Will Marcus finally find the courage to soar and to open his heart to more than just a little girl and a few interfering witches who have crept their way in? Marcus and Cass are "two people who...spent half their lives walking solo." Have they finally found the partners of their hearts? Debora Geary has done it again, taken her stable of truly loveable characters and had them dance together to the music of Ireland in a small fishing village, Fisher's Cove, Nova Scotia, the realm of matriarch of Nova the Scotia clan, Moira. This book starts with a review of the characters that have populated this remote place in the past and continues with an update introducing the new members of this isolated community. Buddy MacMaster, an 88 year old fiddler with roots directly to the Irish or Debora Geary has done it again, taken her stable of truly loveable characters and had them dance together to the music of Ireland in a small fishing village, Fisher's Cove, Nova Scotia, the realm of matriarch of Nova the Scotia clan, Moira. This book starts with a review of the characters that have populated this remote place in the past and continues with an update introducing the new members of this isolated community. Buddy MacMaster, an 88 year old fiddler with roots directly to the Irish origin of Celtic fiddling is the resident expert and mentor to all new and budding talent. Cassidy Farrell is a young beautifly fiddler who has been making the rounds internationally and gaining fame as the one to watch. She still visits the Barn in Margaree and plays with Buddy as her schedule allows. They both delight in the innerplay of each others music. Ellie is a budding fiddler with talent and aspirations that may lead her to challange Cassidy in a few year. Dave is M/C at the Barn and Innkeeper in Margaree. He's the one who suggested that Cassidy may enjoy the environment at the Sea Trance Inn In Cape Breton run by Elorie's husband, Aaron with their twins Aislin and Lucus. Marcus and the violet eyed babe that Even fostered on Marcus and the village, Morgan, also live there. The lovable witchlings, pirate loving Sean, Book reading Kevin and Lizzie, a small healer dynamo also live here. I had a hard time waiting for this to come out. It was worth the wait. I was trying to decide why this series is so good. I think because the passion the different characters feel about their lives. Nell her family and her business.Caro and knitting,Nat & yoga,Lauren finding the right home for people. Aaron cooking. The characters are all passionate and caring for each other. Even groucy Marcus. It makes the readers passionate too for more. I have read all the books in this series more than twice. It is that good for me. Cassidy is the newest witch to come to Nova Scotia. She is world cass fiddler from Ireland. She also has a little magic. She has three weeks off from touring and decides to visit Fisher's Cove. A friend told her about it and the rocks agreed she needed to go their. Cassidy hears the rocks sing to her. She listens to the planet. Cassidy finds the unexpected besides good food she is drawn to Marcus and Morgan. She also finds that talking about magic they freely do in Fisher's Cove. In fact she finds a lot of witches their. They are all wanting to listen to her playing. Aaron is glad to feed her in exchange for hearing her anytime. He is the one who recongizes who she is. With all the children listening to her play it makes me want to go put some Irish music on. And I am not one who likes to listen to music much. The passion of Cassidy's music comes across so well. They are have duel's in realm Gina and Marcus are teamed up together. Lots of music,laughter,food,magic, babies and love in this book. The plot is simply well told story of finding a home and roots. I was given this book by the author and asked to give a review of it when done.,Excited that their is more coming next month. Discription below taken off of Amazon. Finally, we're getting to find out what happens with Marcus and Morgan, but first we have to me Cassidy Farrell, and she is a remarkable woman! I love reading about strong women who have great talents. Marcus, on the other hand, is somewhat of a curmudgeon, set in his ways, and a bonafide bachelor with a cute l Finally, we're getting to find out what happens with Marcus and Morgan, but first we have to me Cassidy Farrell, and she is a remarkable woman! I love reading about strong women who have great talents. Marcus, on the other hand, is somewhat of a curmudgeon, set in his ways, and a bonafide bachelor with a cute little tiny baby girl named Morgan. He's doing just fine with his life until Cassidy comes along. Then his whole world turns upside down...again. When Cassidy rolls into town, she's called by the rocks, but it is the music that speaks thru her and out to others, including wee Adam. I just love all these books by Debora Geary. Some have spoken to me more than others and this is one of them. Music and the arts have always been an important part of my life and A Celtic Witch speaks volumes. Not only does Cassidy have a tremendous gift, but she shows someone very special that he has a gift as well. I was eagerly awaiting the next book in the Witch series and I was not disappointed. In fact, this is probably my favourite one yet. As a native Nova Scotian, this really spoke to me. While I'm not from a small village, the culture and the people are very similar all over the province. This is the story of Cassidy, an Irish fiddle virtuoso, who is taking her annual vacation away from her busy tour schedule. She always goes back to Margaree in Cape Breton, Nova Scotia to recharge her batteries, p I was eagerly awaiting the next book in the Witch series and I was not disappointed. In fact, this is probably my favourite one yet. As a native Nova Scotian, this really spoke to me. While I'm not from a small village, the culture and the people are very similar all over the province. This is the story of Cassidy, an Irish fiddle virtuoso, who is taking her annual vacation away from her busy tour schedule. She always goes back to Margaree in Cape Breton, Nova Scotia to recharge her batteries, play for small audiences and re-center herself. She's also a witch. She hears the vibrations and magic in the rocks, probably the planet itself. She hears about Fisher's Cove and feels drawn there by the rocks. When she arrives, she meets Marcus, the curmudgeonly witch who has been struggling to bring up a tiny babe, Morgan. They both feel an instant pull to each other but neither is ready to open their hearts and change their lives. Not yet. For once, Moira, the Irish "matriarch" figure of the witches doesn't have to nudge them but does make a few salient points and asks a few pointed questions. It's inevitable, no surprise, but the story of both of them finding a new way in their lives is spellbinding. Pun intended. This book had everything I have come to expect from Debora Geary and the witching community that she has created. The characters are always interesting and could step right off the page fully realized and start living their lives. The language is never to complicated but makes you feel at ease as you read. The landscapes are so vivid that you can see yourself walking the roads or sitting in someone's kitchen or parlor. 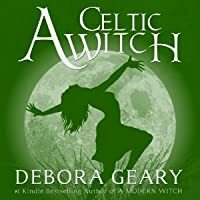 Cassidy 'Cassie' Farrel is a famous Irish (Celtic) fiddle player who has taken This book had everything I have come to expect from Debora Geary and the witching community that she has created. The characters are always interesting and could step right off the page fully realized and start living their lives. The language is never to complicated but makes you feel at ease as you read. The landscapes are so vivid that you can see yourself walking the roads or sitting in someone's kitchen or parlor. Cassidy 'Cassie' Farrel is a famous Irish (Celtic) fiddle player who has taken three weeks to recharge and find her center before she starts her next set of concert tours. She is told about Fisher's Cove (by the rocks, as in earth) and decides to take some time in the quiet fishing village not knowing that a large number of the inhabitants are witches. Marcus Buchanan has finally settled into his role as a father to Morgan and a part of the community. He has no desire to share Morgan, any more than he already does, and Cassie makes that very hard for him. I really loved getting to spend more time in Nova Scotia as opposed to California, though we still have a visit from the Walker clan no matter where things are happening. This is a fun, light, romantic story that will enchant anyone. Enjoy this and the entire series. I love this series. The magic, the love, the family, the community, the belonging, it is all so amazing. I always feel like I am there, a member of the characters’ lives. All of the witches in their communities are so down to earth and this story of Cassidy and Marcus is so charming. Marcus has always thought of himself as the grumpy solitary man whom doesn’t want to be around people. However with Morgan’s love already melting his heart, he is learning to love, but will he ta It only gets better. All of the witches in their communities are so down to earth and this story of Cassidy and Marcus is so charming. Marcus has always thought of himself as the grumpy solitary man whom doesn’t want to be around people. However with Morgan’s love already melting his heart, he is learning to love, but will he take the chance on Cassidy. Cassidy is everything that Marcus wasn’t and yet everything that he wants to be. She isn’t sure if their connection is where she wants to be. Cassidy is an accomplished fiddler and traveler. Can she grow roots and is this the place to do that? The people of Fisher’s Cove are hoping that this is the correct place for her, but only time, the rocks and Cass herself will know for sure. If you haven’t read this series you should. I truly enjoy the characters, their loves and their community. This is such an awesome series. So make your next book one from this series, which is best if read from the beginning. So, sit down, put your feet up and visit the wonderfully witchy communities of Fisher’s Cove and Berkley, you won’t be disappointed. What an incredible read! The world of The Modern Witch series is so incredible. All kinds of characters reflect what we see in the real world. We have the grumps, the loving grandparent, worried parents,rambunctious kids, kids that have to be grown up way before their time, and lost person. These stories tell the tale what a tight, loving family can do together. I don't know how Debora does it, but she can describe her world in ways that make it so lifelike! The physical descriptions are good, b What an incredible read! The world of The Modern Witch series is so incredible. All kinds of characters reflect what we see in the real world. We have the grumps, the loving grandparent, worried parents,rambunctious kids, kids that have to be grown up way before their time, and lost person. These stories tell the tale what a tight, loving family can do together. I don't know how Debora does it, but she can describe her world in ways that make it so lifelike! The physical descriptions are good, but the emotional settings are INCREDIBLE! I could almost feel Marcus's confusion between his responsibilities as a single dad and his feelings for Cass, the fear of change Cass felt as she realizes her traveler self is wanting to set roots. I think the neatest character (that isn't a character) is Rosie, Cass's violin. The way Debora describes it, you'd swear it's a living, breathing person! This review has been hidden because it contains spoilers. To view it, click here. This is the one where we get a bit more of Irish Witchdom and the Canadian Cape Breton folk music tradition, as well as a clear romance for Markus. There's also foreshadowing of Moira losing more of her witchy powers, even as everyone in her Nova Scotia fishertown takes care of her. Geary again implies that love, marriage and children are an indelible part of growing up. So be aware of that. I really liked the idea of ancient traditional magicdom blending into well-explored magic schools and thei This is the one where we get a bit more of Irish Witchdom and the Canadian Cape Breton folk music tradition, as well as a clear romance for Markus. There's also foreshadowing of Moira losing more of her witchy powers, even as everyone in her Nova Scotia fishertown takes care of her. Geary again implies that love, marriage and children are an indelible part of growing up. So be aware of that. I really liked the idea of ancient traditional magicdom blending into well-explored magic schools and their new addendums introduced in previous books. I also liked that, while marriage is important for a female witch in Geary's world, it doesn't mean Cassidy has to give up her job - Geary always has her witches doing what they loved doing before AND being amazing at raising families. Just finished this wonderful book. I have become highly enamored of Debora's tight knit family after reading the previous 5 books in the series, and found this book a nice break from the California Witches Central local. Set in Nova Scotia, this book brings an unexpected change to their crankiest witch and the new light of his life Morgan. Will he be open to yet another change that threatens to bring down the last walls around his loving heart. Just to be a silent witness of the opening of two he Just finished this wonderful book. I have become highly enamored of Debora's tight knit family after reading the previous 5 books in the series, and found this book a nice break from the California Witches Central local. Set in Nova Scotia, this book brings an unexpected change to their crankiest witch and the new light of his life Morgan. Will he be open to yet another change that threatens to bring down the last walls around his loving heart. Just to be a silent witness of the opening of two hearts that had been closed for so many years left me with a renewed heart. What keeps me anticipating the next books in the series are not only her well crafted characters, but the warmth of family that permeates and ties them all together. Not just their lives as witches, but the generosity and openness that they all share. If I didn't already know there is magic in the world around us, these books would allow at least a peak in the door. Debora, may the fair winds always guide you where love and family reside. Blessed be. I love these books. The relationships, the family, the troublemaking children and the adorable babies are all an integral part of the Modern Witch series. Throw in a bit of magic, cookies, and of course pink fluffy bunny slippers and it’s about as good as it gets for a somewhat urban fantasy/ romantic comedy/ light read entertain. There is not just humor but also wisdom that people don’t need to be perfect to be loved and to love, that sometimes the best things are free to give. In some ways I f I love these books. The relationships, the family, the troublemaking children and the adorable babies are all an integral part of the Modern Witch series. Throw in a bit of magic, cookies, and of course pink fluffy bunny slippers and it’s about as good as it gets for a somewhat urban fantasy/ romantic comedy/ light read entertain. There is not just humor but also wisdom that people don’t need to be perfect to be loved and to love, that sometimes the best things are free to give. I'm still enjoying this series. It was great to revisit Fisher's Cove, and I liked this book much better than A Nomadic Witch, with its ever increasing cast of characters. This one was more insular, and I liked that. That said, I'm finding myself less satisfied with each new book, and I can't quite pinpoint the reason why. Maybe it's because I've gotten used to the setting and the characters, and while it's good to revisit old friends, the plot lines just don't have the same oomph as they had ea I'm still enjoying this series. It was great to revisit Fisher's Cove, and I liked this book much better than A Nomadic Witch, with its ever increasing cast of characters. This one was more insular, and I liked that. The next chapter in The Modern Witch series - a light but satisfying read, filled with characters that I have grown to care about. This series is strangely addicting. Wonderful series with good character development and lots of family support. Story line is very enjoyable. Can't wait for the next one!!!! To be clear, I loved all of these books; they're heartwarming and have a knack for putting me in a pleasant, mellow mood. This book in particular has had a profound impact on me. In it, we're introduced to Cassidy Farrell, and her character charmed me. I've always loved great violin music, but hadn't listened to much fiddle music. In the book, Cass interacts with a fiddler named Buddy MacMaster, and on a whim, I did a search of the name. Lo and behold, I found video of the late Buddy MacMaster, To be clear, I loved all of these books; they're heartwarming and have a knack for putting me in a pleasant, mellow mood. This book in particular has had a profound impact on me. In it, we're introduced to Cassidy Farrell, and her character charmed me. I've always loved great violin music, but hadn't listened to much fiddle music. In the book, Cass interacts with a fiddler named Buddy MacMaster, and on a whim, I did a search of the name. Lo and behold, I found video of the late Buddy MacMaster, legendary Cape Breton fiddler, and I immediately had to watch and listen to him. To youtube I went, and was spellbound (I know, right?). He's every bit as amazing as he's described in the book. I finally found one video (link at the bottom) of him playing a well known Scottish tune called "Neil Gow's Lament for the Death of his Second Wife", and it brought me to tears. I immediately started making plans to start studying the fiddle; if I can one day play even half as beautifully, I will consider my life well spent. I've been studying Irish Fiddle for nearly 9 months now, and I love it more everyday. It's become my passion, and my fiddle is never far from my hands, and I want to thank Debora Geary, late though it might be, for setting me on the path. I love her work, both Witch Central, and her newer work under the nom de plume Audrey Faye, and I look forward to reading it for many years to come. Didn’t see that coming! If you liked Morgan’s story, you will love how it continues. Unfortunately, the books are no longer available to purchase. Looks like the last I will be able to read. Very sad! Witches Under Way (WitchLight #2) - continues Didn’t see that coming! If you liked Morgan’s story, you will love how it continues. Unfortunately, the books are no longer available to purchase. Looks like the last I will be able to read. Very sad!